No, but really. I can’t be the only one who isn’t grossed out by the smell of my own, but gags instantly if walking near the bathroom after someone else’s nastiness has ensued. I mean, come on! Even my farts don’t stink, but everyone else has some serious noxious gases coming out. 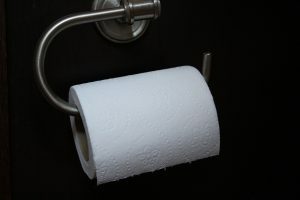 I’m positive there is some really cool science behind the phenomenon, probably microbiological, but let me tell you, it no longer applies when you have to mess with your own poop. For the next 90 days, I am working on being the subject (N=1) in an ancestral high fiber diet study of my own design. N=1 basically means there is only one subject which isn’t enough to make it a valid study. But hopefully, I am just the first one and I will actually get some valuable information for perfecting the experiment for others. But back to the pressing question: Why am I playing in poop? Well, to get data for this study, I am sending in a microbiome kit from Ubiome, a company that will test up to five different bodily sites to see what bacteria is currently residing there. I am only testing my gut microbiome, but to learn about it, I had to send in a small sample of poop. Yes, it is as bad as it sounds! I got a great deal when there was a sale on a holiday weekend and bought three kits for the price of one. They sat in their shipping bag under my nightstand table for about 4 months while I decided what to do with them. When I was finally ready to try out my own experiment, a 12 week proposition, I determined that I would do one kit pre experiment, one at 4 weeks, and the last at the end of 12 weeks. So, after a month of not as clean eating, (I want to be able to see a big difference in four weeks! ), I was ready to bust out my first sample. I recently listened to a podcast about gut health, in which the doctor/host recommended a process for the sample collection which included taking a small amount of feces from the middle of the…er…session, smashing it up so that it is a nice mix of bacteria and rolling the sample stick through THAT. 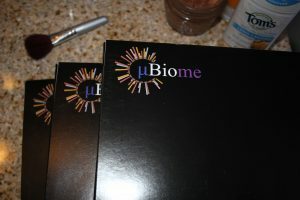 I wasn’t sure I’d be able to do it, but I reserved judgement until I could read UBiome’s instructions. It was surprisingly less gross than I thought. After registering the kit online, a fairly simple and straightforward process, all I needed to do was take a piece of used toilet paper, cover the sample stick with some brown, and swirl it in the little tiny vial for a minute. I decided that midsession smashed poop was a little overkill and went with the simplicity of the kit’s instructions. (Whew!) After sealing everything up, I tossed it into the mailing envelope the company provided and sent one of the kids to take it to the mailbox. I know it could take 1-3 months before I get back any information, but we are now all set and ready to get started on my experiment with a baseline of data for comparison. If you are interested in getting your own kit, you can use the coupon code CRUMBS to get 10% off! Let me know in the comments if you have done it, and maybe share some of your results. I can’t wait to hear about it!